Many people do not realize the health values of potato peels. There are many vitamins nutrients, fiber and antitoxins in the skin that people tend to peel and throw away. Eating the peel can help with the protection against cancer and heart disease. 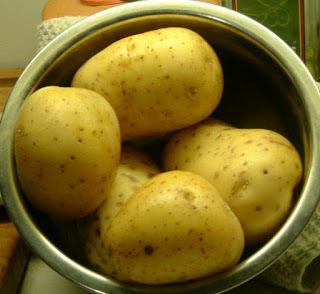 Vitamins and minerals that are in potatoes as well as potato skins are vitamin C and B6, potassium, manganese and copper. When leaving the skin on the potato when cooking it you are keeping the nutrients in the potato itself. When I prepare mashed potatoes I always scrub the potatoes really well and very rarely do I ever peel them. A great benefit of doing this other than the healthy aspect of it is that you save so much time. The peel mashes up just as well as the actual potato. When adding to soups and stews I chop them up just like any other vegetable leaving the peels on. There are so many ways in which you can prepare potatoes to enjoy them and reap the healthy benefits. French fries and baked potatoes loaded with butter and sour cream do not fall under the healthy way in which to eat this vegetable. Whenever I crave French fries I use the following recipe. Scrub potatoes and cut into ½” strips. Place the strips into a large bowl with your ice water, cover, and chill for about an hour. Preheat oven to 475 F Remove the strips and dry well with paper towels. Put all the spices into a plastic bag and shake to mix. Put potato strips into a bowl and coat with oil. Add the potatoes to the plastic bag with the spices and shake to make sure that the strips are well coated. Place on a non-stick shallow pan and cover with foil and cook for 15 minutes. Remove foil and turn strips over, then continue to bake for another 15 – 20 minutes.